Mid-week market update: Callum Thomas conducts a regular weekly (unscientific) Twitter poll of equity market sentiment, and the latest results show that both fundamental and technical bullishness are falling. These readings suggest that bullish momentum is waning. Indeed, daily MACD has been decelerating and turned negative this week, indicating that the bears are taking control of the tape. 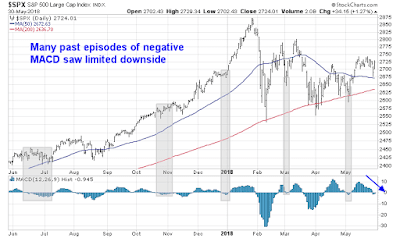 However, I would point out that many past episodes of negative MACD in the last year has seen little market downside, so an aggressive bearish trading stance may not be warranted. That`s not the whole story. With that caveat, I offer two offbeat forecasts for the markets for this coming Thursday and Friday. 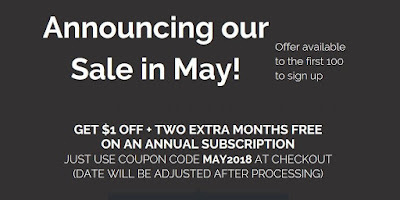 Time is running out for our Sale in May! The offer is available only to the first 100 to sign up. Please use this link to order. 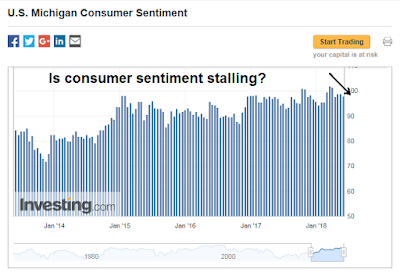 Could a weak consumer stall the economy? The headlines look dire. CNN proclaimed that "40% of Americans can't cover a $400 emergency expense", according to the Fed's annual Report on the Economic Being of US Households. Further research from Google Trends showed that interest in consumer items is tanking. In addition, searches for bankruptcy and financial reorganization spiked recently, indicating rising stress in the household sector. 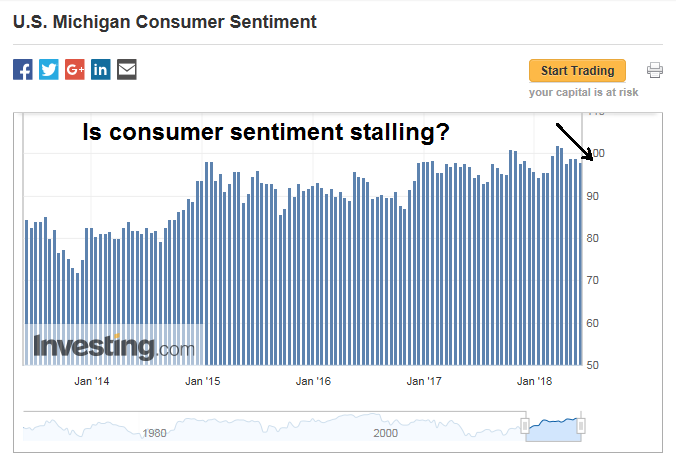 Last Friday's release of consumer sentiment missed expectations and readings are continue to deteriorate. The economy is at or near full employment. Is this as good as it gets? Is this what prosperity looks like? What does this mean for policy makers? Is this precursor to a bull market killing recession? Was the recent big tax cut not enough? CNBC reported that President Trump is proposing further tax cuts before November. He went on to pressure Congress to enact funding for his budget priorities on Twitter. There was no hint in this or any other subsequent tweet that Trump is going to propose offsetting spending cuts (or, heaven forbid, revenue increases) to compensate for the additional spending he’s demanding. Trump’s recently-announced rescission package (which is already in a great deal of political trouble with congressional Republicans) doesn’t come close to offsetting the new spending Trump said he wants. It also won’t come close to being an offset even if the first package is followed with that second rescission plan Trump has said is coming, but which so far seems to be totally imaginary. Here at Humble Student of the Markets, I believe that the determination of the proper path of fiscal policy is above our pay grade. Instead, my focus is on positioning portfolios for any changes in government policy. 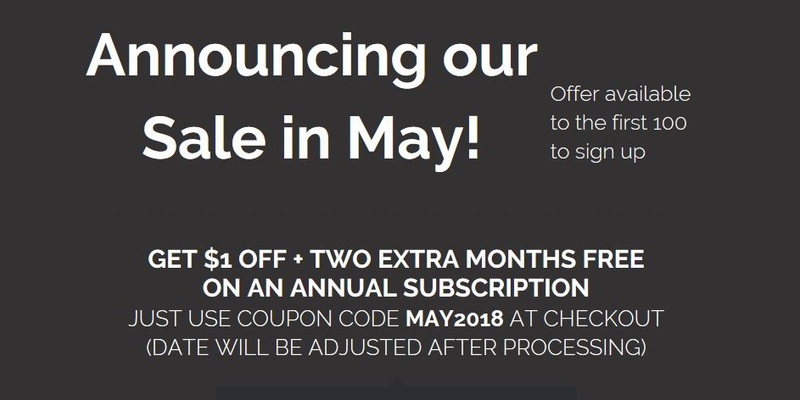 We would further like to announce our Sale in May. The offer is available only to the first 100 to sign up. Please use this link to order. Mid-week market update: There remains a fair amount of stock market skittishness among my readers and on my social media feed. 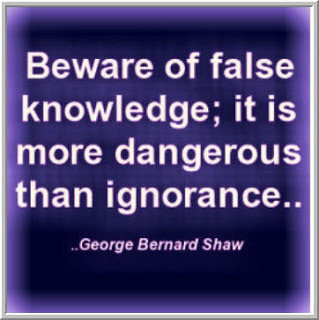 Let me assure everyone that bear markets simply don`t start this way. 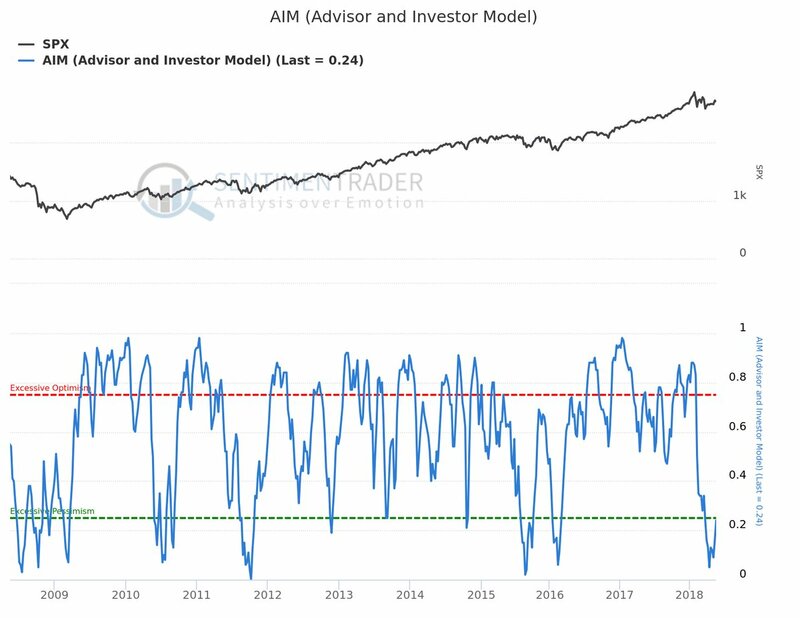 SentimenTrader has an intermediate to long-term sentiment model called AIM "which averages the momentum of the four major sentiment surveys". This model is not perfect at calling the exact bottoms or spotting exact turning points. Nevertheless, it has done a good job of defining the risk and reward of owning stocks when readings are at bearish extremes, which is contrarian bullish. The model is currently on a buy signal. From a top-down macro perspective, Bespoke recently pointed out that the Philly Fed General Conditions Index hasn't been this high for some time. Despite the mutterings of permabears (I'm looking at you Rosie), recessions simply do not start this way. BTW, the Philly Fed New Orders component surged to an all-time-high, and the last time it rose this much in a single month was October 2005. These conditions are all pointing to further intermediate term equity strength. Expect a test of the old highs in the major equity indices this summer, and probably new all-time highs. However, stock prices don't go up in a straight line. The short run equity outlook is a little different. Back in March, I wrote about the new Fragile Five, which were five highly leveraged developed market economies that were undergoing property booms. The five countries are Australia, Canada, New Zealand, Norway, and Sweden. 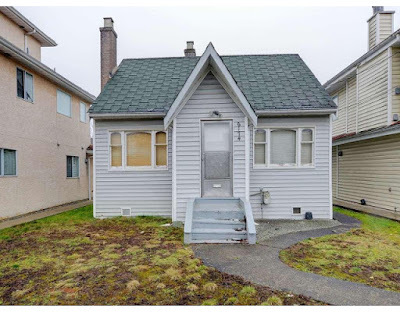 As a reminder of how insane property prices are in Vancouver, which is one of the epicenters of the real estate boom, I highlighted this little gem that was listed for about USD 1 million. Here is the same beauty from the back. For some perspective. 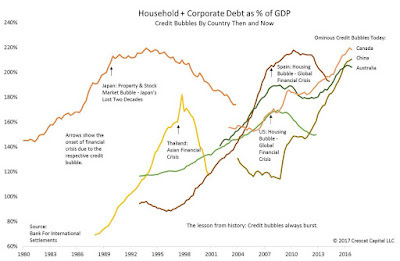 This chart depicts the debt bubble in Canada and Australia. 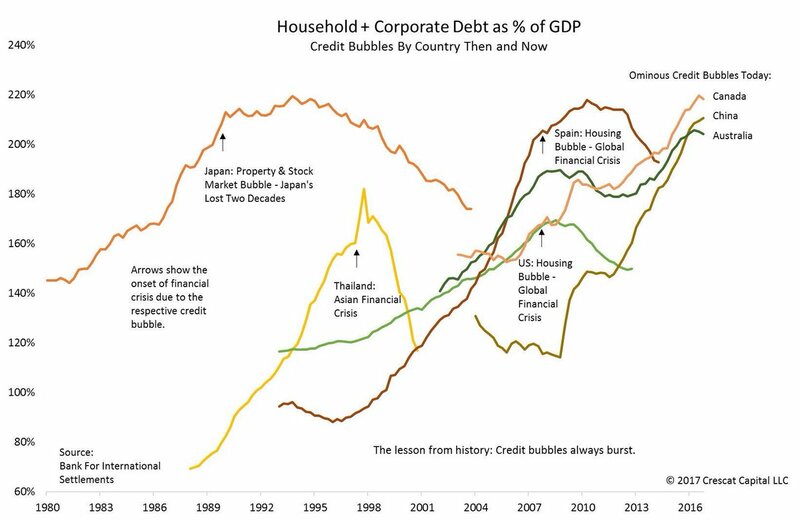 If you are worried about runaway debt in China, then you should be equally concerned about the property bubble in the other Fragile Five countries. So far, this has been a "this will not end well" investment story with no obvious bearish trigger. 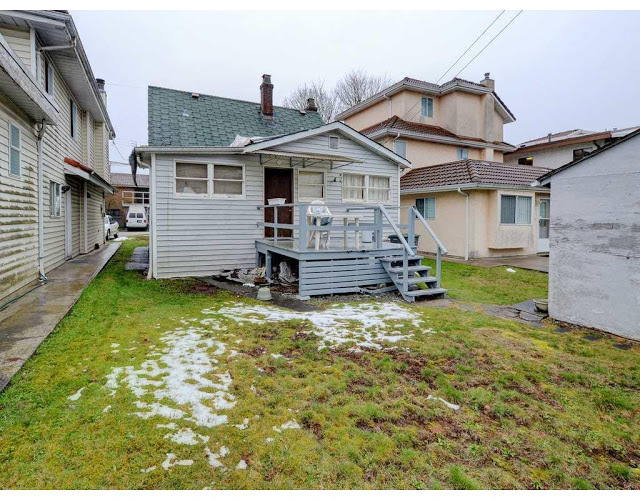 Now, there seems to be signs of a turning point in the Canadian economy. 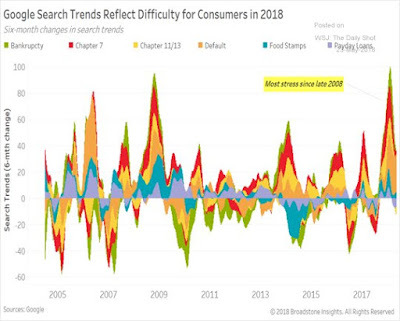 The BAML Fund Manager Survey (FMS) is one of the most interesting surveys around, as the frequency is regular (monthly), extensive, and it has a long history. For readers who are unfamiliar with the survey, it reflects mainly the views of fund managers with global investment mandates. The day of reckoning, as defined by either a recession or even a yield curve inversion, is still a long way in the future. Portfolio risk appetite remains above average. The highlights of the consensus portfolio bets amount to long energy, short USD, and short bonds. This analysis is highly speculative, but if I were the market gods and I wanted to inflict the maximum level of pain on market participants, here is what I would do. Mid-week market update: Charles Dow once characterized the stock market`s price movement as being composed of tides, waves, and ripples. We can see a mini version of this thesis by the market's action in the past week. The major indices had staged an upside breakout through a downtrend and sentiment had turned bullish. 10-year bond yields had spiked significantly above 3%. The US-North Korea summit is at risk of going off the rails. The anti-migrant Lega Nord and anti-establishment Five Star Movement are on the verge of forming the next Italian government. The Sino-American trade talks are undergoing their own roller coaster. Trump's weekend "rescue ZTE" tweet was followed by a White House clarification that walked back some of rhetoric. Which is the wave? Which is the ripple? Tame inflation? Don't get complacent! 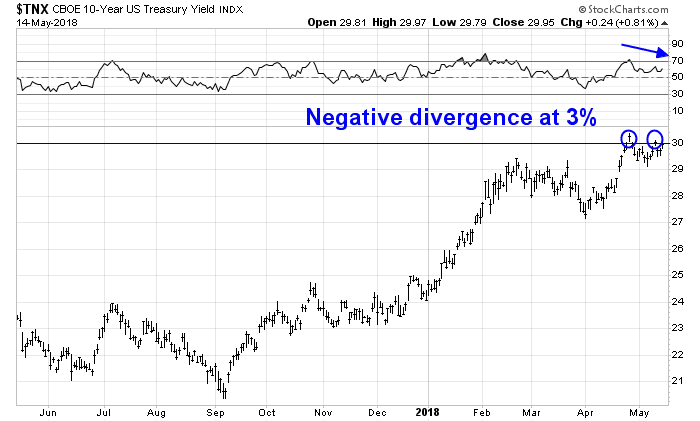 The Treasury market rallied last week when the 10-year Treasury yield tested the 3% level and pulled back. 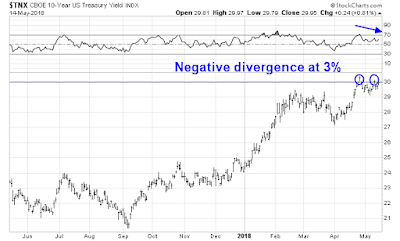 While the bond market rally is likely to have a bit more leg over the next few weeks, my inclination is to enjoy the party, but don't overstay the festivities. In the wake of last week's publication (see Why I am not ready to call a market top), I had a number of discussions with investors that amounted to, "What about _________ (insert the worry of the day)". Fed policy error as they tighten into a decelerating economy. I conducted an (unscientific) Twitter poll, and respondents were mostly concerned about a Fed policy error, while the oil price spike was the least of their worries. While I believe that all of these risks are legitimate, they can be characterized as yellow flags, but there are no red flags that signal an imminent recession or equity bear market. Mid-week market update: In my last mid-week market update (see Still choppy, still consolidating), I highlighted the weekly (unscientific) sentiment survey conducted by Callum Thomas. The poll showed fundamentally oriented investors to be very bullish, while technical survey was bearish. I suggested at the time that one of the signs that the sideways consolidation may end was an agreement between the fundamental and technical survey, indicating either positive or negative momentum. The latest survey shows that such an event has occurred as technicians have flipped from bearish to bullish. While this is not an unqualified trading buy signal, there are plenty of indications that the bulls are back in town. Over the years, I have had a number of discussions with traders who have religiously embraced specific trading systems and investment disciplines. This is a cautionary tale of how systems fail. Lumber’s sensitivity to housing, a key source of domestic economic growth in the U.S., makes it a unique commodity as it pertains to macro fundamentals and risk-seeking behavior. On the opposite end of the spectrum is Gold, which is distinctive in that it historically exhibits safe-haven properties during periods of heightened volatility and stock market stress. When you look at a ratio of Lumber to Gold, it is telling you something about the risk appetite of investors and the relative strength or weakness in economic conditions. When Lumber is leading Gold, volatility in equities tends to fall going forward. When Gold is leading Lumber, the opposite is true, and equity volatility tends to rise. 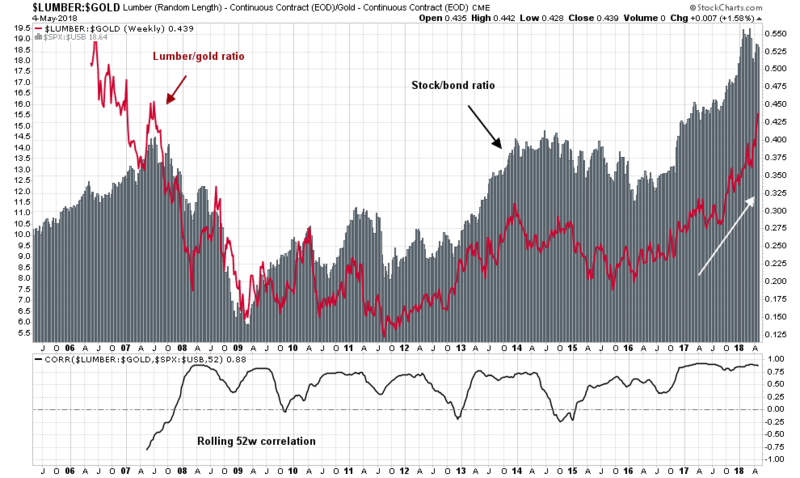 History shows that the lumber/gold ratio has been an excellent indicator of risk appetite. The bottom panel of the accompanying chart shows the rolling correlation of the lumber/gold ratio (cyclical indicator) to the stock/bond ratio (risk appetite indicator). 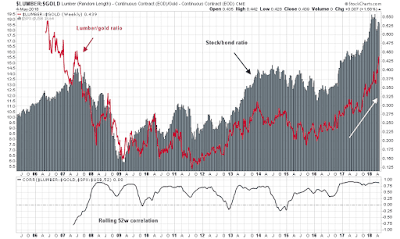 The lumber/gold ratio is rising, which is a buy signal for risky assets. Does that mean that you should bullish on stocks? Maybe. 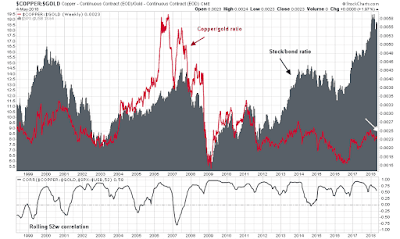 Consider the copper/gold ratio, which is another cyclical indicator based on a similar theme. 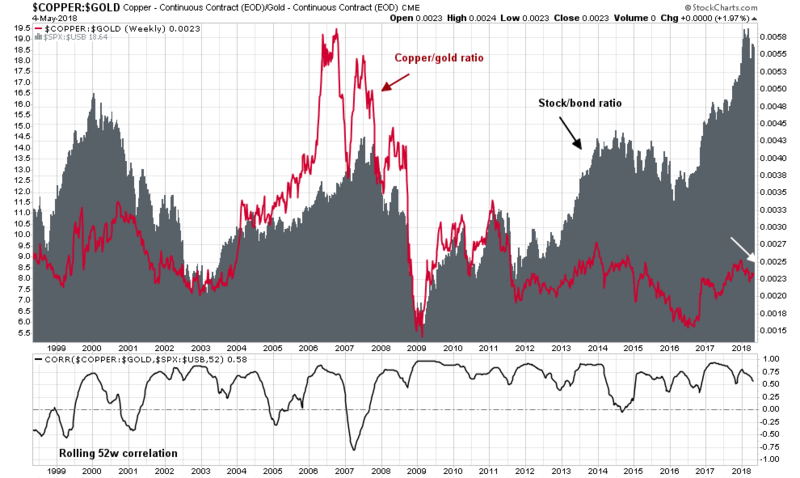 The copper/gold ratio is telling a story of economic softness. Should you be buying or selling? Which indicator should you believe? As stock prices chopped around in an indecisive fashion in past few weeks, the traders in my social media feed have become increasingly nervous and bearish. The bull can point to the SPX repeatedly testing its 200 day moving average (dma), which has held as technical support. However, the market's inability to rally despite what has been good earnings news during a Q1 earnings season with solid results is worrisome. My review of intermediate and long-term technical market conditions, as well as the macro backdrop reveals that no pre-conditions of a bear market are in sight. 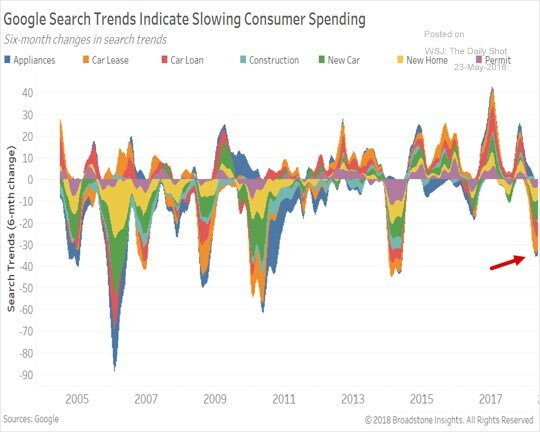 While there are concerns that the American economy is undergoing the late cycle phase of an expansion, which is typically followed by a bear phase. I am not ready to make the investment call that stock prices have topped out just yet. 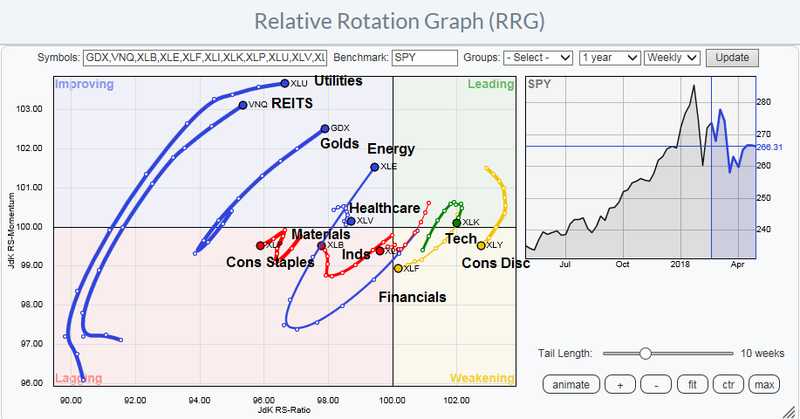 Consider, as an example, the Relative Rotation Graph (RRG) as a way of analyzing changes in sector leadership. RRG charts are a way of depicting the changes in leadership in different groups, such as sectors, countries and regions, and market factors. The charts are organized into four quadrants. An idealized group rotation pattern occurs in a clockwise fashion. Leading groups (top right) deteriorate to weakening groups (bottom right), which then rotates to lagging groups (bottom left), which changes to improving groups (top left), and finally completes the cycle by improving to leading groups (top right) again. 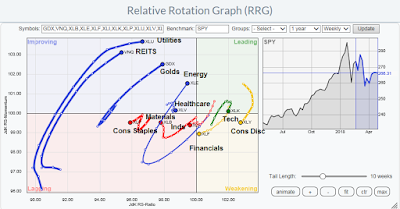 The latest RRG chart depicts a stock market with the emerging leadership of late cycle inflation sectors (gold and oil), which is the result of late cycle inflationary pressures, along with interest sensitive sectors (REITs and utilities) as the result of a dovish Fed. This combination suggests that the market is setting up for one last inflationary blow-off before the Fed steps on the monetary breaks to cool the economy into a bull market killing recession. Mid-week market update: Stock prices are still consolidating sideways. The technical pattern could either be described as range-bound, or as a triangle. The market tested the bottom of the triangle this week, but support held. The market indecision could be traced to the continued disagreement between fundamental and technical investors. 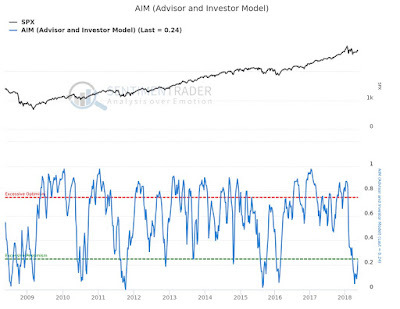 Several weeks ago, I highlighted a Callum Thomas weekly (unscientific) poll of market sentiment showing a record level of technical bears combined with a high level of fundamental bulls (see Technicians nervous, fundamentalists shrug). The latest reading shows a continued bifurcation of opinion, though the difference in opinion is not as extreme. The market may continue to trade sideways until fundamental and technical opinions begin to agree again.